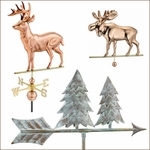 For years weathervanes have been used to judge wind direction in order to forecast changing weather patterns. 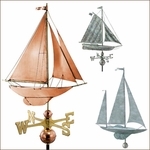 Nowadays, weathervanes are used more for decorative purposes. 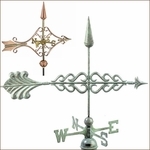 Perfect for any home or garden, our selection of garden weathervanes and full-sized weathervanes for sale will beautify your space as well as serve a functional purpose. 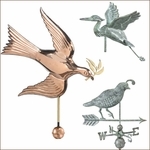 Most of our decorative weathervanes are handcrafted by artisans from pure copper and brass or aluminum. Humans have always been dependent on the weather and wind. And the weathervane is a timeless reminder of how reliant we have been on this simple, yet functional, ornament. 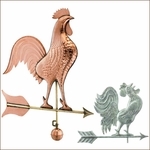 For centuries, people have farmed and harvested crops based on weather and the direction of their weathervane. 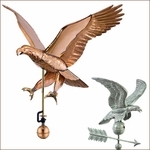 The word �vane� is derived from an Old English word �fane� meaning �flag� or �banner.� And when America was first founded, weathervanes were placed atop steeples showing citizens� pride in their new country. New Englanders used sea symbols like fish, seagulls and ships to reflect their surroundings, while American pioneers included farm animals and Native American themes. 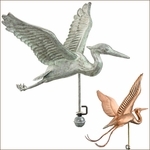 Weathervanes are now mainly used as decorative art to enhance lawn and garden spaces, but still represent tradition. 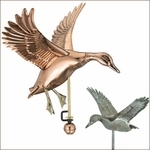 Our decorative weathervanes look beautiful in gardens and make great gifts. 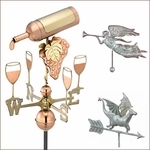 We hope you are pleased with the selection we�re offering and wish favorable winds blow your way. 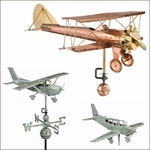 Shop our beautiful weathervanes for sale! 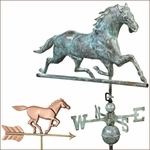 The weathervane is one of the oldest tools used to determine weather. 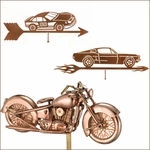 Weathercocks, aerovanes and windvanes are other names used. Weathervain, weathervein and wettervane are some common misspellings. The largest weathervane appears to be a retired and perfectly balanced 20m long, Douglas DC-3 airplane sitting on a carefully designed pedestal alongside the runway at Whitehorse Airport in Yukon. From what we can tell, it has not yet been officially recognized, with the Guiness World Record for largest weathervane still being held by an enormous Weather Vane resting atop the Tio Pepe facility in Jerez, Spain. The "Ella Ellenwoon" Schooner resting in downtown Monague, MI is quite outstanding as well! 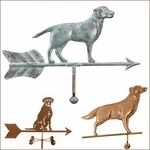 A weathervane always points into the wind so the wind is coming from the direction in which the weathervane is pointed. 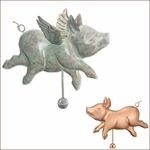 Stop blowing aimlessly in the wind, take home a weathervane today! 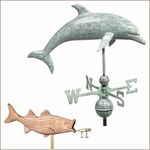 Click here to go back to our full selection of weathervanes!